The City Council slush fund abuse can be solved with one act: the City Council can require that all government grants to non-profit organizations go towards the benefit of their intended beneficiaries, and specifically exclude salaries, consulting fees and other service fees to organizers, friends and family members. This would stop the creation of multiple non-profits for little or no reason other than to collect government grants and then just as rapidly wheel the funds out to their management. The State Legislature should follow the same example. The conditioning of government grants on compliance with "strings attached" has plenty of precedent. Public campaign financing, for one, places many restrictions on how campaigns can use public funds. And in the private sector, lenders and investors often condition their financing on a long list of permitted uses and forbidden uses. A violation is a serious thing...it's called a default. The use of such positive covenants and negative covenants is so commonplace in financing transactions that, in my opinion, the absence of such covenants for many government grants must be viewed as intentional. If such a law had been on the books several years ago, a certain Bronx elected official would not be heading to federal prison after his sentencing, scheduled for October 2009. A federal jury took less than one full day to convict former New York Supreme Court Justice Thomas Spargo of attempted extortion and soliciting a bribe from lawyers who had cases before Spargo. Spargo was found to have tried to extort money from lawyers appearing before him in court in order to help him fund his legal costs to defend himself in an investigation into his conduct by the Commission on Judicial Conduct. Spargo was widely considered to be a top election law expert in New York State and advised on petition drive election law compliance for prominent campaigns including the presidential campaigns of H. Ross Perot in 1992 and Steve Forbes in 1996. Multiple reports this afternoon that Christie was pulled over and given multiple tickets in Lambertsville (where's that?) for driving an unregistered, uninsured vehicle. I assume this means he simply didn't have the docs on him, as is common when multiple people drive one vehicle. But wait -- according to the media reports, all of Christie's wife, their kids, and -- you've got to be kidding -- the ubiquitious and way-overexposed Michele Brown were all in the vehicle. Okay, theory one debunked. But here's the intriguing part. 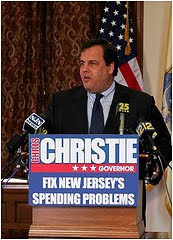 The reports add that the tickets had the words "NO DEAL" in the margin, and one radio report strongly implies that Christie tried to throw his weight around. Flash back a few years (2006). Then recently appointed Attorney General Zulima Farber shows up at the scene when her boyfriend gets pulled over in Fairview (Bergen County). Farber reportedly says to the hapless police officer, "Don't you know who I am?" (or something very much to that effect) and otherwise acts or speaks inappropriately (at least for an AG) to secure a special favor we mere civilians do not enjoy. All you need to know is that Governor Corzine practically ordered Farber -- the state's first Hispanic/Latina attorney general -- to resign and leave before the door hit her on the way out. The bleeding continues. It's only August. At this rate, Corzine's toughest obstacle to re-election will have been Hudson County's 9/11 conspiracy theorist Jeff Boss. If Christie were a stock, he'd be getting shorted. It's a trading mentality. His brother would know. Eric Dixon is a New York lawyer and strategic analyst who engages in crisis management and other matters. Mr. Dixon cautions readers that this article is not legal advice. Mr. Dixon may be contacted for further comment through edixon@NYBusinessCounsel.com, or at 917-696-2442. The recent Appellate Division decision Homes of Hope vs. Eastampton Township, Superior Court Appellate Division Docket No. A-5551-07T2, is shocking. The decision effectively nullifies a township's zoning ordinances by raising the bar very high for any zoning board to deny a variance from zoning ordinances if the applicant for a variance wants to build a project that constitutes a "beneficial use," such as -- but not limited to -- the construction of affordable housing. From a legal perspective, the court takes a clear "activist" approach as opposed to the "judicial restraint" which respects the voice of the people as expressed through the legislature. The enemies of judicial activism have plenty of cannon fodder with this decision. The restriction on a zoning board's ability to enforce its own codes or to issue or deny variances renders the codes pretty meaningless. The decision comes close to prescribing criteria whereby a developer becomes entitled to a variance if there is a "beneficial use." Variance abuse is common and recognized in both New Jersey and New York. This decision will encourage it... as well as eminent domain actions or similar "redevelopment" actions which could have the same impact or result as an eminent domain seizure. This is a very pro-builder, anti-existing-owner decision that threatens the basic property rights of all New Jersey property owners (commercial or residential). Now, this decision encourages developers (or townships) to develop properties and apply for all sorts of variances negating zoning laws, with no regard for current owners or residents or any adverse impact on their property values or quality of life, as long as they assert their "beneficial use" safe harbor. OK, let's seize Grandma's house to build a new highway -- it's a beneficial use! See where this is going? As an unintended consequence, townships will be far less inclined to build any affordable housing if this decision is upheld by the Supreme Court if their previous compliance with the Council on Affordable Housing (COAH) mandates does not help them argue against a "beneficial use." Now, zoning boards may be expected to presumptively rubber stamp denials on affordable housing applications and force any developer of such projects to go to court. Short term, this will reduce affordable housing construction without question. NJ's #2 Federal Prosecutor Quits After Christie Loan Flap; Is Another Shoe About to Drop? The purported controversy over Chris Christie's $46,000 loan to a former subordinate of his in the U.S. Attorney's Office has claimed its first casualty -- the former subordinate AUSA! Michele Brown, the second-in-command at the U.S. Attorney's Office covering the District of New Jersey in Newark, NJ, has resigned effective immediately following the disclosure that she and her husband borrowed $46,000 from now-gubernatorial candidate Chris Christie in 2007 at a time when Christie was both the United States Attorney and her direct boss. It is also being reported in various sources that the current interim U.S. Attorney (Ralph Marra) is being investigated by the Department of Justice for certain comments made regarding the recent wave of political corruption arrests that some perceive as showing a particular political bias. This follows a long water-drip of accusations that certain investigations and prosecutions were undertaken on the basis of political considerations as opposed to actual criminality; curiously and perhaps not coincidentally, some of the people rumored to be the subject of such investigations have become extremely vocal about this topic in the past few weeks. Background coverage and commentary on this topic in earlier blog entries below. In a possibly related move, New Jersey State Senator Raymond Lesniak today penned an op-ed on the Star-Ledger opinion website (nj.com) in which he openly speculated not as to whether, but as to when Christie would quit the gubernatorial race as a result of the Brown loan and several other controversies that have erupted in the past two weeks. Questions: Why is she resigning? If she did nothing improper or illegal, why not stand your ground? Why end a long career as a federal prosecutor? And...why do so after merely a few days of controversy? Or, does someone know that there is much, much more to this story, so that it was known that the moderate heat this story generated during the "dog days" of August when half the world is on vacation would pale in comparison to the hell-fire sure to come after Labor Day? Is there a second shoe about to drop? Was there already a "deal" in place to arrange new private employment -- surely more lucrative than the top federal prosecutor pay grade of around $156,000 annually -- for Brown? Who among us just quits a job? What? In this economy? When the Labor Department's U-6 unemployment rate is in the high teens? Why is Michele Brown the one taking the bullet here? Conclusion: All of this points to the Christie campaign feeling severe political heat. As this blog forecast just last week, the Christie loan revelation could "kill the campaign" and this author holds true to that conviction. (See the blog entries below for yourself, especially "Republicans Need a Torricelli.") At a minimum, they can't stop the bleeding, and the vultures, already in the air, are circling closer and closer. Los Angeles County coroner reports that traces of a powerful anesthetic were found in the bloodstream of the pop star Michael Jackson; other reports state that the Los Angeles Police Department is treating this as a homicide. Speculation may turn to Jackson's doctor Conrad Murray, who is reported to have been prescribing various medicines and painkillers. If he is in jeopardy of being criminally prosecuted, this may become yet another case where a professional is charged with a crime for essentially being negligent. Are we going too far in second-guessing our professionals? What is the "mens rea" element needed for a crime? Is it the doctor's "intent" to proscribe a certain drug? Over a certain amount (which prosecutors and expert witnesses can second-guess and disagree upon)? Or -- is a mistake by a professional a crime? If you are in a car accident and someone dies, will some young prosecutor looking to make a name for himself -- or build that resume to shop for a law firm job -- try to find fault (bad judgment) in how you were driving as a basis for a murder rap? And in these cases, don't hesitate to think that the investigation starts out with the conclusion first and works its way backward; there's no pretense of using the scientific method (proposition > procedure > testing > result > conclusion). Many facts have yet to come out. But this could be among the growing list of cases which cause many in our medical professions to practice defensive medicine. And don't for a moment think that this "defensive" mentality does not extend to other professions like law and accounting. A spokesman for the Bureau of Prisons denied that uber-Ponzi-scheme-artist Bernard L. Madoff has cancer or is somehow not expected to live long. This is in response to an apparently poorly-sourced New York Post report this morning which now seems to have been based on the say-so from an inmate. Lesson to Madoff: Any effort at sympathy will demonstrate more of the chutzpah your lawyers already demonstrated (in asking for a sentence of 10-12 years) and which resulted in you getting the max (150 years, or 100% of what the government proposed) at sentencing. If you're unhappy, appeal it so your victims can revel in your smackdown by the Second Circuit. On the other hand, when your top-dollar lawyer gets you no value-added at sentencing, even after you've pled guilty and offered "assistance" to the authorities, maybe your faith in your counsel is shaky. Earth to Madoff: there are thousands of underemployed lawyers out there, and some of them actually know what they're doing and would love a challenge. The New York Daily News (http://www.nydailynews.com/) reported this week that New York State Assemblyman Nelson Castro (D-Bronx) may be facing criminal felony charges of perjury arising from his allegedly perjurious testimony in a 2008 election law case. Last year, Castro was accused by a political opponent of engaging in a form of election fraud involving allegedly false voter registrations. The genesis of this allegation was the discovery that nine people were registered to vote ... from one address. That's a lot. Given the notorious voter apathy in certain parts of the Bronx, that level of political awareness raised an eyebrow. Further eyebrows were raised when it turned out the address was a one-bedroom apartment. Even in tough times, jamming nine people in a one-bedroom is a stretch. Even for the Bronx. And to make matters worse for Castro, said address belonged to...Nelson Castro. So Mr. Castro had to explain who these other eight people were and probably some questions as to living arrangements. Castro must have put his foot in his mouth. According to 2008 press reports, he said something to the effect that he didn't know these people were registered out of his apartment...even though some of these were relatives of his or of his campaign manager! Now, the judge in New York State Supreme Court, Bronx County, found there was no proof of fraud on Castro's part. However, Castro tesstified under oath, under penalty of perjury, in this case. Why do this? From a legal perspective, this was probably necessary to defend his designating petition because there is a line of case law under which judges may draw an adverse inference against a respondent-candidate (such as Castro) who is accused of election fraud or petition fraud and who elects not to testify in open court. However, this testimony -- if ultimately proven perjurious -- exposed him to additional and greater criminal liability that far outweighs any downside he would have suffered by getting his 2008 designating petition invalidated. One must wonder whether he received the proper legal counsel in 2008. Did his attorney know enough about the law to properly warn him about the criminal consequences of perjury? Did his attorney know enough about the real facts of the case to recognize the potential for perjury? Or, did Castro simply lie through his teeth to his own counsel? Did Castro think he could just dance and sing his way past this claim? Now, if reports are correct, Castro expects to be charged criminally. A conviction could cost him his freedom and his office. The tragedy is that there is apparently no reason for this, except to get a handful more petition signatures or votes. Furthermore, gathering these signatures is not difficult at all. In Castro's district, Democratic voters virtually fall from the sky. Perjury is serious stuff. Go ask Scooter Libby. Or Martha Stewart. Or even Bill Clinton, impeached for suborning perjury. If Castro did commit perjury and gets charged, convicted and incarcerated, he can blame himself for his hubris in thinking he could lie on the record and get away with it. Final note: If Castro were a candidate in Northern New Jersey, would the U.S. Attorney's Office have acted first? The following was posted on PolitickerNJ.com Thursday, August 20th and is reprinted in its entirety (as it appeared on August 21st). When I find the video that is cited, I will try to post it here, so you can make up your own mind. Here's a link to the 35-second YouTube video at http://www.youtube.com/watch?v=G1xu2Ay3oBs. I believe these comments suggest that a Christie Administration may dispense with the need for evidence, proof or plain old fashioned fairness in going after the "waste and abuse" it identifies. (And think about how "waste and abuse" is defined, and who is doing the defining. Somehow, images of the K Street Project and the excesses of Tom DeLay...and some guy named Jack Abramoff...flash.) Are we going to have a new governor who is boasting already that he's got his conclusions lined up, no matter the real facts (they get in the way!) and procedures be damned, he's going full steam ahead to justify the conclusion. Even when he's wrong. Such an approach leads to mistakes and tempts coverups by people who cannot bear to admit they goofed. (See: Bush / Cheney 43, Nixon 1.) Remember, much is in the eye of the beholder. U.S. Rep. Frank Pallone (D-Long Branch) says that GOP gubernatorial candidate Christopher Christie has promised state jobs to former federal prosecutors who worked for him and wants Christie to make a full disclosure of the "political overlap between his campaign and the law enforcement responsibilities of his former staff in the US Attorney's Office." Pallone's statements come after a video of Christie suggesting that he would take a group of Assistant U.S. Attorneys with him to Trenton appeared on the Internet. "The more we learn about Mr. Christie's penchant for mixing campaign politics with law enforcement the more evidence there is that he has broken the law multiple times," said Pallone. "Breaking the law is bad enough for any federal employee, but it is especially bad by those with the responsibility of enforcing the law impartially and responsibly." Christie, speaking at an event sponsored by State Sen. Bill Baroni (R-Hamilton), told that audience that "we're going to ferret out waste and fraud and abuse in the government. I think you know I'll do that better than anybody." "Now Mr. Christie is essentially acknowledging that he has a political plan that revolves around former employees - who are all barred from political activities," said Pallone. "He should disclose who they are, what they communicate with each other and what plans they are making. Mr. Christie is no longer responsible for enforcing the law but he isn't supposed to break it." Assemblyman Jay Webber (R-Morris Plains), the Republican State Chairman, took a harsh tone in his criticism of Pallone. "Representative Pallone's assertions stretch believability to the breaking point and approach the territory of a paranoid conspiracy theory. Congressman Pallone has politicized the legislative process, and now he's impugned the integrity of an entire office of public servants. To allege misconduct in high places, without facts and on the flimsiest of inferences, is reckless, irresponsible, and sleazy,” Webber said. “Congressman Pallone should be ashamed of himself. He owes an apology to the U.S. Attorney's office and his constituents - who would be better served if the congressman focused on the issues he was elected to deal with." Always good to plug another site. Check out http://www.bloombergwatch.com/ and http://www.fedupnewyorkers.org/ and our friends at Fed Up New Yorkers, run by a group led by Neil Fabrikant. Excellent writing and political commentary, and some absolutely superb illustrations of New York's Maximum Leader. Mike Bloomberg: Why New York City needs term limits. Here is an abstract of an upcoming article proposing an amendment to the New York State Constitution that would override the New York City Council's original overturning of the two-term limit on all elected representatives to city office. The two-term limit was originally enacted after a public referendum was passed overwhelmingly in 1993 and then reaffirmed in a second referendum. It is hard to think of an action, anywhere in the country, showing less respect for the unquestioned popular will of the voters than the 2008 vote overturning the two-term limit and allowing current officeholders to remain for a third term. 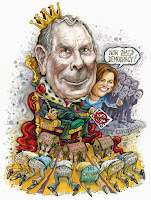 The outrage New Yorkers feel over the evisceration of the two term limits referenda from the 1990s by Mike Bloomberg and the City Council knows few bounds. It crosses all lines in our society, whether they be geographic, ethnic, age, class or ideology. It reduces our city to two camps: democratic versus autocratic. Public referenda are apparently just a waste of time. Documenting the popular mood over this topic may be a similar waste, as there is a broad consensus extending even to many supporters of Bloomberg and other two-term incumbents seeking to hang onto their offices like calcified barnacles on crusty fishing boats in the briny Canadian Maritimes. The answer to this abomination may be found by taking a cue from the United States Congress, which responded to President Franklin D. Roosevelt’s four terms (his fourth being cut short by his death shortly after his third re-election in 1944) by proposing in 1947 the Twenty-Second Amendment limiting the President to two terms and submitting it to the states for ratification. After the requisite three-quarters vote of state legislatures was achieved in 1951, the new amendment limited the chief executive’s term in office. I propose that the New York State Legislature borrow a page from the early Cold War-era Congress and enact a similar amendment to the New York State Constitution limiting the term of any official, elected by all the voters residing within any city with a population equal to or greater than one million people as enumerated in the most recent United States census, to two elected terms or ten years (the latter being necessary if the official takes over during the latter half of his or her predecessor’s term of office). The constitutionality of this proposal should engender little serious debate as the Twenty-Second Amendment has survived its court challenges and outlasted its critics. There could be an equal protection issue because this amendment seems targeted at only New York City – which is certainly true; the State Legislature is free to drop the population cutoff to cover Buffalo, Rochester and Yonkers if it desires. But perhaps its most important feature is the political equity and popular goodwill that it would engender. This proposal could hand the much-maligned State Legislature, and even a poll-challenged governor, with a sure-fire political winner and in an election year to boot. The mechanics of such a proposal are a little complex. A constitutional convention would have to be called. It is likely that some sycophants will attempt to delay this from happening, and lawsuits will surely be filed somewhere in order to further hold up this change. Nevertheless, state legislators could “get the ball rolling” on an issue this fall. And after Bloomberg’s machinations on mayoral control this summer and his generally arrogant demeanor since his entry into public/political life, many Albany representatives could use something with which to rehabilitate their personal lives, political obligations and family concerns. Chris Christie has admitted to financial non-disclosures creating serious conflicts of interest regarding his former, official government position, and to the failure to report loan income. The circumstances of the loan (made to a direct subordinate deputy federal prosecutor working under Christie and now the #2 federal prosecutor in the entire state of New Jersey) make the arguments/excuses of "I forgot" or "I didn't know" or "I didn't consider it an asset" either unavailable or frivolous. If YOU tried the same thing, guess what would happen to YOU? Some Republicans are tempted to overlook Christie's "lapses of judgment." The only reasons are either that (a) it can't possibly get worse than Corzine, or (b) Corzine / the Democrats are so corrupt, sleazy, etc. (substitute your own adjective) that anything the Republicans / Christie et al. do or have done is "not as bad." Either reason smacks of pure desperation. "Vote for us, we're "not as bad" as the other guys!" "Vote for me: It's only a little tax evasion"
"Vote for me: It's only a minor undisclosed conflict of interest -- trust me!" There are numerous New Jersey politicians or connected people -- as well as a certain former Alaska Senator -- who seem to have committed (or been accused of) the same failures to disclose. (Google the names Joseph Ferriero, Dennis Oury and Ted Stevens.) Just pick one and compare the facts. It is fair to speculate that, if Chris Christie were the mayor of Perth Amboy, Chris Christie the U.S. Attorney would have convened a grand jury and pushed for criminal felony charges. And here, just think, Christie has admitted to his failures to report the loan income or make the requisite tax payments, and to his failures to disclose the loans. Slam dunk case. If you say "it's minor," ask yourself whether that argument is bought by prosecutors or judges when the issue is a gram of cocaine, or a bribe of $100. When does Christie get referred to as Candidate 1? When do we see "CC" (meaning "Chris Christie" and not "co-conspirator" although in New Jersey, ya never know) in a federal charging document (the legal parlance is called an "information")? Chris Christie fails to report income on his 2007 and 2008 tax returns from a loan. But it's not just any loan and not just any borrower. Christie made the loan while U.S. Attorney, and the loan (principal amount approximately $46,000) is to his #4 subordinate in the U.S. Attorney's Office, Michele Brown. (UPDATE: Ms. Brown was the #2 deputy in said office when this blog entry was made; on August 25th she resigned, effective immediately.) Christie is granted back a mortgage on Ms. Brown's house. Credit to NJN for being first with the story. Good for taxpayer-funded NJN! Link to report here at http://www.youtube.com/watch?v=Rr1K81Yigf0. News Item 1-A: Christie fails to disclose said loan/relationship on either the required federal forms for federal employees, or on state reporting forms for state candidates. Christie now admits it was a mistake...but only after discovery of the loan and its nondisclosure. And that's a problem. * As with Nixon's "enemies list," being a Republican is no insurance. (See: Treffinger, James.) In fact, if the theory of political considerations driving decisions to investigate, prosecute or take no action proves correct, then could anyone who is not an ally of the list-keeper risk being classified as an obstacle to the list-keeper's achievement of his objective? Accordingly, being a "non-ally" or "disloyal" Republican would tend to put one in greater danger by virtue of being in greater proximity to the list-keeper (by being in the same party, being able to compete among the same contributors, organizations, etc. for support). The controversy about the Bank of Christie may really not be about a loan. It most certainly is about his judgment. Observers are entitled to view the years-long non-disclosure as a form of a coverup. Just like Watergate and Bill Clinton's perjury, it's the coverup that's the issue. A really curiously-concealed loan (albeit one documented in a recorded mortgage), made to a curious recipient who just coincidentally enough was a direct subordinate. And that's a problem. It creates a strong appearance of impropriety and cronyism. When you purport to be the ethics candidate and have no other issues, this could kill the campaign. And that's a problem. But it's not just Christie's ethics and integrity which are now suspect. It's Christie's judgment, the judgment that let him make this totally questionable loan in the first place, and then let him think it would be so minor that he did not take the requisite steps to make sure it would be disclosed. In some provinces, bad judgment gets turned into a felony. And that's a problem. What on earth was Christie thinking, bailing out a subordinate's husband's financial mismanagement? Why is Deputy U.S. Attorney Michele Brown going to the U.S. Attorney for a loan? You mean there was no one else she could turn to? For $46,000? (As Len Dykstra said, "that's ashtray money, bro.") You mean there were no teaser rate credit card offers going to the Brown residence? You mean they couldn't do a refinance / cash out / subprime negative amortizing loan? You mean there wasn't some Amero-Nigerian bank willing to offer a bridge loan from the Most Honorable Prime Minister Smith looking for a trustworthy American? I guess the morning Brown woke up, desperate and realizing Christie was the Lender of Last Resort, she didn't check her e-mail and never saw the oodles of spam us mere "little people" -- you know, we who, like, pay taxes -- receive daily/hourly/every 30 seconds. Even if all these arrangements were legal, regular common sense dictates they not be done. Political common sense -- rare with Republicans -- dictates a big red light flashing "STOP." An attorney with regular common sense (or a regular, in-check "id") should consider the risk of the appearance of impropriety. The risk alone mandates saying "No" -- unless you're the type of attorney who measures this risk against the likelihood of getting caught. If you're making that kind of cost-benefit analysis, you're in Peter Cammarano territory. Mayor-for-one-month Peter is an attorney too (and just like Christie a self-declared "reformer" and connected, politically-ambitious Seton Hall Law grad who seems to be missing something in the judgment category). Unless you've been in a different solar system, you know it hasn't been a good summer for Peter the Reformer, who awaits his turn to be ground into powder by our justice system. So the analysis comes down to this: Did Christie not think for a moment that at some point this would be discovered?? Wasn't he thinking?? Or, maybe he was thinking... that no one would mine the Morris County records... that he could get away with it. Maybe he took that old Traveling Wilbury's song "Tweeter and the Monkey Man" (sung by Bob Dylan) to heart: "In Jersey everything's legal...as long as you don't get caught."